Big Brother has finally been introduced to football (soccer). Technology has made a huge impact to sports like baseball, hockey and American football and now it has made its presence known at the 2014 World Cup in Brazil. There will be no more controversy as to whether the ball has completely crossed the goal line or not like there was during the 1966 World Cup when England’s Geoff Hurst thrilled the home crowd and sent the West Germans home with a goal off the crossbar. New goal-line technology in soccer consists of a total of 14 cameras mounted on the roof of the stadium; 7 of which are pointing at each of the goals. The ball is photographed in three dimensions and when the entire ball passes over the goal line, encrypted signals are sent to the referee’s watch which indicate that a goal has been scored. The cost is approximately $260,000 for each stadium. A new watch isn’t all that was awarded to referees. They will also carry a can of vanishing spray housed in a holster attached to their shorts which will be used for marking proper ball placement and for staking the line not to be crossed by defenders who are lined up as a human wall on set plays. The spray foams up like shaving cream and lasts between 45 seconds and 2 minutes before dissolving harmlessly into the pitch. The invention of the spray can be attributed to Argentine journalist Pablo Silva after he was ejected from a 2002 match played with some old school friends. Angered that defenders kept encroaching on his free kicks, he decided to team up with a chemistry engineer to develop the vanishing spray called 9:15, (9:15 expresses in meters the 10 yard distance allowed on free kicks) which became widely available and used by Argentine leagues in 2008. Most referees agree it was the holster that allowed for the use of the spray technology! 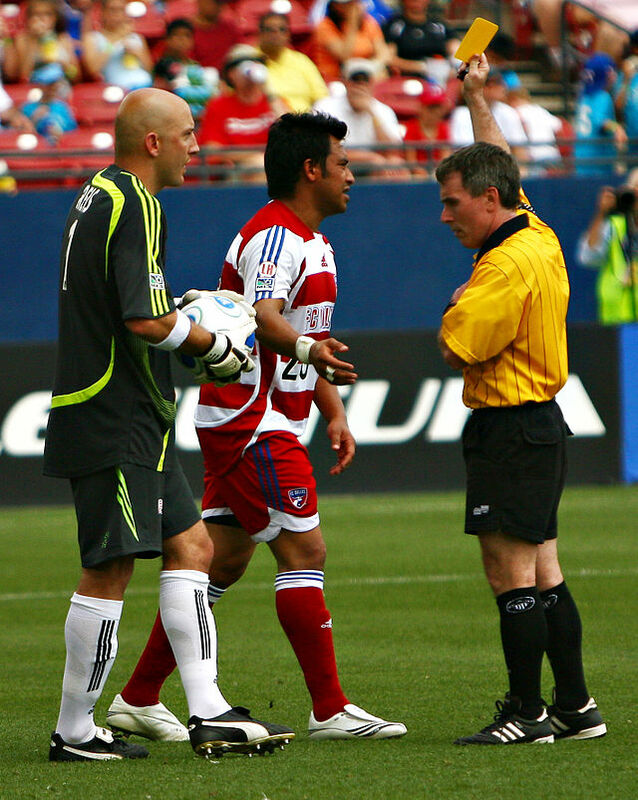 Embellishment of penalties is becoming more and more a nuisance to referees in both the sports of soccer and hockey. Don’t you just hate when a hockey player performs the death scene when his opponent’s stick comes up and barely hits him in the mask? The best is in soccer, when players who are hardly touched, fall down with that grimacing look that makes you think they are giving birth. The team then pleas to the ref for the penalty kick only for the ref to turn the other way and use the arm gesture to play on! Knowing his portrayal failed, the disgruntled player gets back to his feet and prepares for the next show. I would like to see technology used here; but just in the penalty area. Potential fouls in the penalty area should allow for play stoppage, incident review and decisive calls of “no foul”, “foul” or “yellow card for diving”. Sepp Blatter, the president of FIFA, has not yet supported the use of technology for calling penalties and off-sides. Perhaps, the 2014 World Cup will provide the controversy to put the matter back on the table. It was just last December that he changed his mind and allowed for the vanishing spray. Hawk Eye Technology In Sport! This entry was posted in Soccer and tagged 1966 world cup, 2014 World Cup, 9:15, Big Brother, FIFA, football soccer, football soccer blogs, Geoff Hurst, goal-line technology, instant replay, new technology, Pablo Silva, penalty embellishment, Sepp Blatter, sports and technologies, Sports Archives, Sports Blogs, vanishing spray. Bookmark the permalink.